Bitcoin is surely making waves throughout the world of finance. The crypto-currency is gaining popularity because of its impeccable anonymity features that is not available with fiat currencies. Many believe that Bitcoin has a bright future ahead and that one day it will become a standard form of payment. We couldn’t agree more. For those that are looking to venture in an investment scheme, there is an easy way of growing your money. Trading binary options is easy and it offers high return on investments. This kind of trading practice is a bit risky though; you either win big or lose everything. There are several binary options brokers out there but not all offer Bitcoin trading. If you want to trade anonymously, you can only do so by signing up with an All-bitcoin binary options broker. One of the very few binary options brokers that are offering an all-bitcoin trading platform is Satoshi Option. Is Satoshi Option the best all-Bitcoin trading platform in the market? Here’s a comprehensive review of the Bitcoin binary options broker. Satoshi Option was launched in 2013 with a main goal of providing a binary options trading platform designed exclusively for Bitcoin transactions. Satoshi Option is the world’s first binary options trading platform that accepts the crypto-currency. However, Satoshi Option doesn’t seem to be regulated by any regulatory board. There is also no information detailing how the company is safeguarding trading activities and fund transfers. As a matter of fact, there is limited information about the company available on the internet. If you are interested in trading at Satoshi Option, please go ahead and read our comprehensive review of the trading platform below. What we love about Satoshi Option is that there is no need to provide any personal information or even a registration requirement to begin with. With no signups required, Satashi Option can facilitate for a secure and truly anonymous trading experience. Satoshi Option offer trading options with different expiration times. The trade durations can go from 60 seconds, 5 minutes, one hour, 3 hours, 24 hours or end of the week. At the moment, there are just a limited number of tradable assets available at Satoshi Option: BTC/USD, EUR/USD, GBP/USD, EUR/GBP, USD/JPY, Gold, Silver, Crude Oil and NASDAQ. 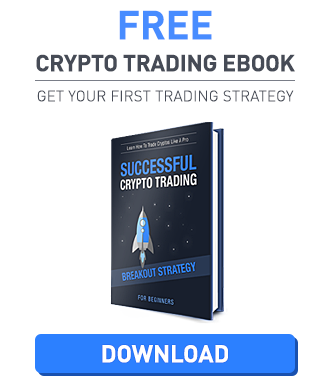 There is no minimum trade amount set for Bitcoin trades. 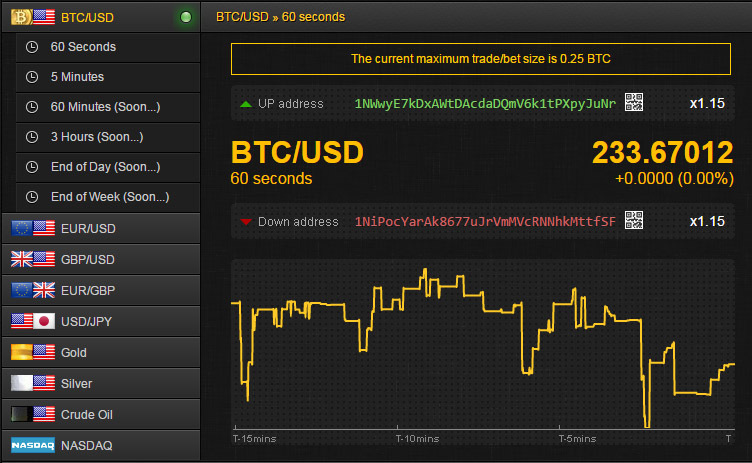 But there is a maximum trade limit that is currently set at 0.25 BTC. To trade at Satoshi Option, traders simply place their wager on an ‘up’ or ‘down’ option. Once the bet is placed, traders will then wait for the duration of their chosen option and if they got the correct prediction, they will instantaneously receive their profit. The return percentage is usually indicated before the traders can place their wagers. Satoshi Option allow traders to send their Bitcoins to a Bitcoin address so they can trade using Bitcoins. Satoshi Option can create a dedicated wallet account for traders so that they can send and withdraw their funds to that address any time. When you want to send your funds back to your Bitcoin wallet, simply click the “Withdraw Button” and your funds will be sent back to the deposit address that was used in funding the account. What if you forget the Bitcoin wallet URL that was created for you by Satoshi Option? When this happens, you don’t need to worry about losing your Bitcoin funds. Satoshi Option only store your funds for a maximum of 3 days since your last trade. If the funds aren’t used within this period, Satoshi Option will automatically return the funds back to the Bitcoin address that was used in funding the account. Unfortunately, there are no available customer support systems at the moment. We know that it can be frustrating to deal with a broker that does not offer any form of assistance. Satoshi Option’s FAQ and How To pages aren’t that comprehensive either. The bottom line: Is Satoshi Option a scam? Satoshi Option is definitely the answer to the desire of Bitcoiners to trade anonymously. Overall, Satoshi Option is outstanding and its trading platform is simple and easy to use as well. We’re just not certain about the legitimacy of the company. Although they seem to be a genuine all-bitcoin binary options trading platform, it would be better if the operator provided some kind of certification to prove that they are indeed a reliable broker to do trades in.